The i30 is a sophisticated alternative to the class defaults, reckons Alex Grant. Diversity is the buzzword for Hyundai over the next five years; 30 new models and derivatives, including 14 hybrid, electric and fuel cell models due before the end of the decade. 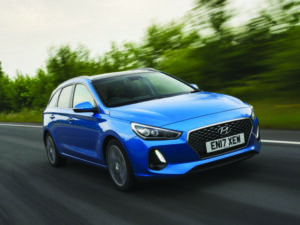 But that’s not coming at the expense of its core product range; the latest i30 showing its ten-year rise into the mainstream hasn’t slowed down yet. Like the i30 hatch, this is a fully-fledged European car; designed and engineered locally to suit the region’s unique tastes in handling, styling and cabin aesthetics. Which means it’s as reassuringly weighty and mechanical in its controls as you’d expect a Nürburgring-honed chassis to feel, with plenty of soft-touch materials, and steering responses and refinement well-tuned to high-speed driving. At 4,585mm from bumper to bumper, it’s at the large end of the segment’s estates; bigger than a Golf or Focus, but shorter end to end than an Astra or Octavia. Load space, at 602 litres with the rear bench upright, or 1,650 with it folded flat, is competitive with the class-leaders (Skoda aside) and it wears the extra bodywork neatly. Of course, sheer capacity isn’t everything, and the i30 makes effective use of the space in the back. The rear seats fold in two sections and there are plastic compartments under the floor for stowing loose or breakable objects. Rails either side of the boot mean it can be divided into smaller sections to stop bags and boxes moving around and there’s an under-floor compartment for the load cover too. All it’s missing is handles inside the tailgate to remotely fold the rear bench. Trim levels mirror the hatchback, with most job-need equipment coming in at the mid-spec SE Nav version. Among that list is Hyundai’s relatively intuitive infotainment system, with Android Auto and Apple CarPlay built in, as well as a seven-year subscription to live weather, traffic and speed camera alerts, and local point-of interest searches. Autonomous Emergency Braking, Driver Attention Alert, High Beam Assist and Lane Keeping Assist are standard-fit across the range. SE Nav also gets most of the engine options; the 109bhp 1.6-litre diesel likely to be the big-seller in fleet, with CO2 emissions from 99g/km and ample performance and refinement for high-mileage drivers. Hyundai only offers the dual-clutch automatic gearbox on the 136bhp diesel, and conversely the lower-powered version is only available with a manual. Petrol alternatives are noteworthy too. The 118bhp 1.0-litre turbo wasn’t available on the launch, but it’s good in other similarly-sized products if potentially not so well suited to fully-laden estates as a diesel engine is. It’s also not offered in Premium or Premium SE guise. The 1.4-litre turbo, at 138bhp, is a great fit for the i30 – smooth, quiet and surprisingly flexible with strong pulling power throughout the rev range. Lower pricing and CO2 emissions at 115g/km and 125g/km respectively, mean they could make sense for some fleets, even compared to the equivalent diesel. A strong all-round offer at the core of the fleet sector. A competitive and well-finished offer for job-need and user-chooser drivers, with some very appealing petrol options for those with usage to suit.